It would seem that I'm a naïve optimist! Whereas I thought the 'industry' around Indigenous art would really like to know an honest figure for the size of the business rather than hang on to past guesstimates, and would want to be able to tout their contribution to both Indigenous poverty and Australia's artistic credentials (as the current campaign to arouse politicians to the underfunding of all Aussie artists is proudly doing), it seems they don't. Or could it even be that their 'business' is so far below their expectations that they're embarrassed to reveal all, even on a commercial-in-confidence basis? And would that then raise doubts about the industry as a whole? And: "Jeremy, if I filled in every survey I wouldn't have a business! " "Thanks for the feedback on the variety of responses... we do realise that some are suspicious of our motives!" As a result, Deloitte Access Economics has extended their final deadline until next MONDAY – JUNE 20th. Deloitte's Sasha Zegenhagen explained: "For the project to be viable to continue, we require just 20 more responses from the survey. As such, we urge you to please complete it to ensure the research can reflect the important role of private art businesses in contributing to the broader Indigenous visual art sector. If time restricts you from completing the entire survey, we would encourage you to complete the first page – current sales." Bring together and build on existing research, to create an industry-wide picture that informs decision making and advocacy. The success of the project depends on sufficient private art businesses participating in the survey. Deloitte’s need more responses to be able to create a complete sector picture. Commercial-in-Confidence: the Australia Council for the Arts will not have access to your business’s data. Deloitte will handle the data securely commercial-in-confidence, and will only present aggregated data. The Australia Council will only be involved in the cultural analysis for publication. 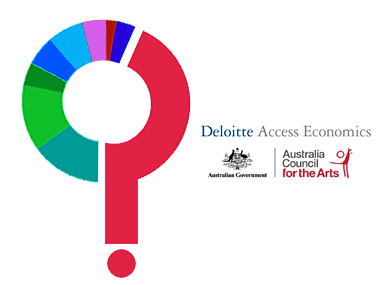 Independent: Deloitte Access Economics will be collecting data to articulate the economic contribution of the industry in Australia, including its impact on employment, tourism and the broader economy.